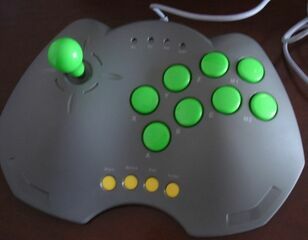 The Tornado DC 2000 is a third-party arcade stick for the Sega Dreamcast. It was made by Arkino Technology corporation, a company based in Taiwan, China. Two other joysticks with the exact same shape were produced for PC under the names PC 2000 and PC 2001. It is possible, as explained on the box, to toggle from digital to analog mode for the stick. The stick is also programmable. Dreamcast memory cards can not be inserted in the DC 2000 Tornado joystick , thus if one wants to save games , either a pad or a stick featuring a memory card slot should be plugged in the console as well.